I spent much of the morning on Sunday, potentially the best ski day in years, at a family gathering in Massachusetts, but as this get-together wound down, I realized that I just might be able to squeeze in some skiing in at the end of the day, if I could get home early enough in the afternoon. Fortunately, the other members of my family accompanying me on this trip fell asleep shortly after departing Massachusetts, so I took this opportunity to drive a little faster than I might normally. While I missed the banter of my family on this several hour-long trip, they did manage to sleep through my driving back to Middlebury at a pace which might have made them a little bit nervous, and indeed, when they awoke a half hour from home, I was implored to continue at or around the speed limit. Nonetheless, I pulled into my driveway with just enough time to take advantage of the sunny day and spectacular conditions, and headed up to Breadloaf! In my most critical views of the Rikert area, my only complaint over the years has been that while there is a lot of good skiing here, it seems that a lot of it is in small, tight loops, never getting far from the touring center itself. When snow is good, I frequently hit Forest Service 59 in order to get deeper into the forest. When I arrived at the touring center however, I noticed some new trails on the map, some of which were rarely groomed, and another which until this year never existed. In particular, I was intrigued by the new trail, labelled “Upper Gilmore”, which ran along the eastern periphery of touring area, paralleling, but never quite contacting FS 59, which serves as a snowmobile trail on the VAST network. 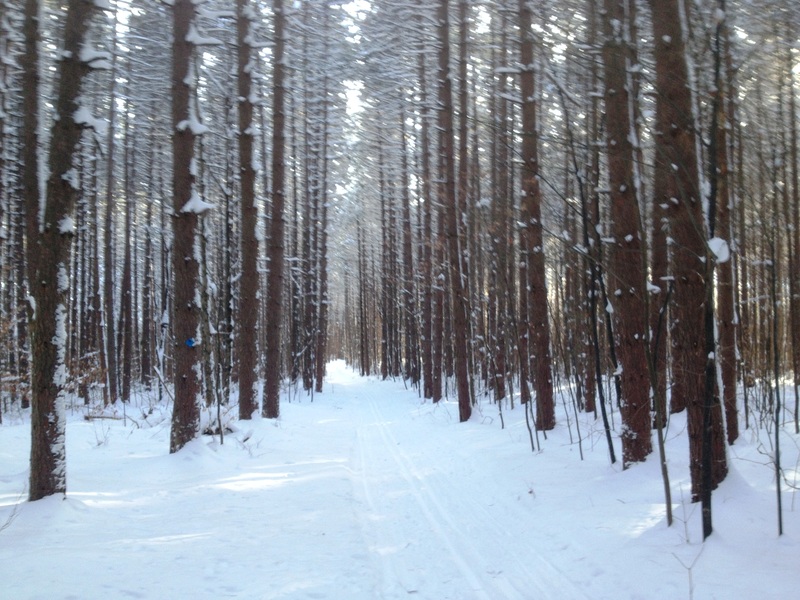 I started this particular ski, warming up on the loops on and around the Battell trail, before turning onto Freeman to access the old Gilmore trail. Previously, this trail has served primarily as a connector to the forest service road and the Norske Trail, but as I cruised by Gilmore House (one of the more out of the way dorms at the summer Wordloaf Conference) and neared the road above, I saw the anticipated new trail veering to my left, and headed up it. This is a great new addition to the trail network – it went on for close to a mile, and in sections had the feel of a bobsled run before connecting with the better known Brown Gate trail. 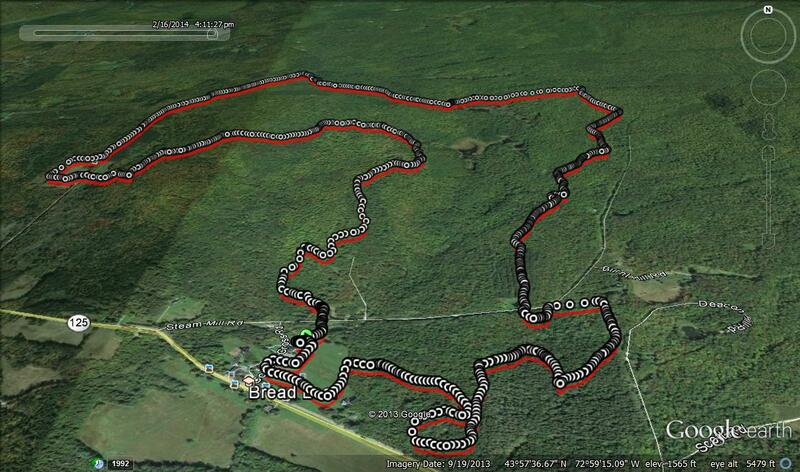 Kudos to Mike and his work crew for putting in this great trail last summer! After enjoying the easy downhill shuss on the Brown Gate Trail, I was treated to a second surprise. The primitive trail leading towards the pile of rubble known as “The Blue Bed House” was also groomed and maintained! Don’t expect much of a house, let alone a blue bed – the eponymous bed probably hasn’t been there for 30 years, and I think the last wall of the house fell 10-15 years ago! Jokes about the condition of the “house” aside, this is a pretty section of forest, which was skied somewhat in the past, but was not made part of the Breadloaf touring area due to property line issues with one of the private land owners. I am glad to see that this has been worked out! 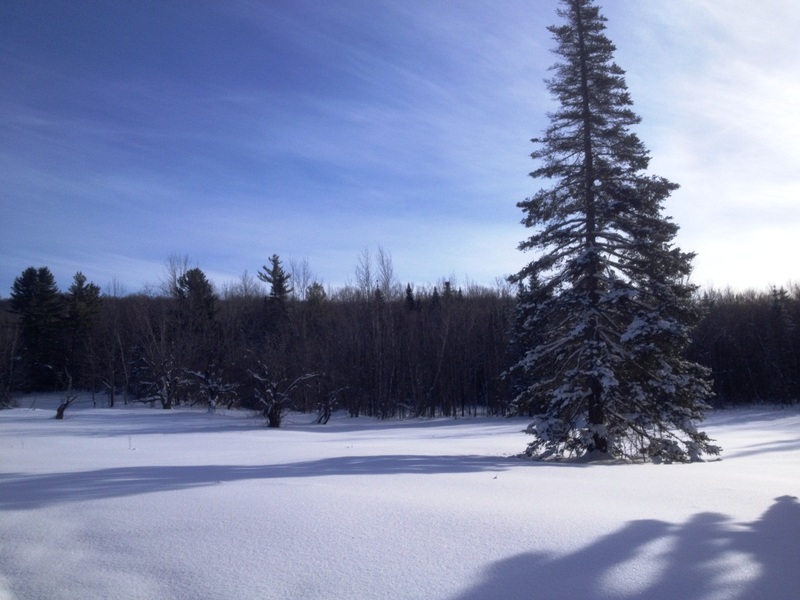 The trail then snaked its way into a beautiful open meadow, offering another easy descent and more great winter vistas. Like most abandoned meadows in Vermont, this one had a few ancient apple trees left behind long after all other farming here had ceased. I know of some local hard cider brewers who are interested in heritage apple varieties – perhaps they should explore here! I also couldn’t resist the temptation to make my initials in the otherwise virgin snow, and squared them for good luck – after all I AM a science nerd! Following the signage to get back to Rikert in time for closing, I enjoyed another particularly pretty stretch of skiing through the tall narrow pine trees that line the trail for a short distance right above the Robert Frost Cabin, and after a loop through these fields, I headed back to the touring center more out of respect to the workers who undoubtedly bad put in a long day, and probably wanted to go home, rather than wait for the stragglers (like me) who didn’t want to quit! 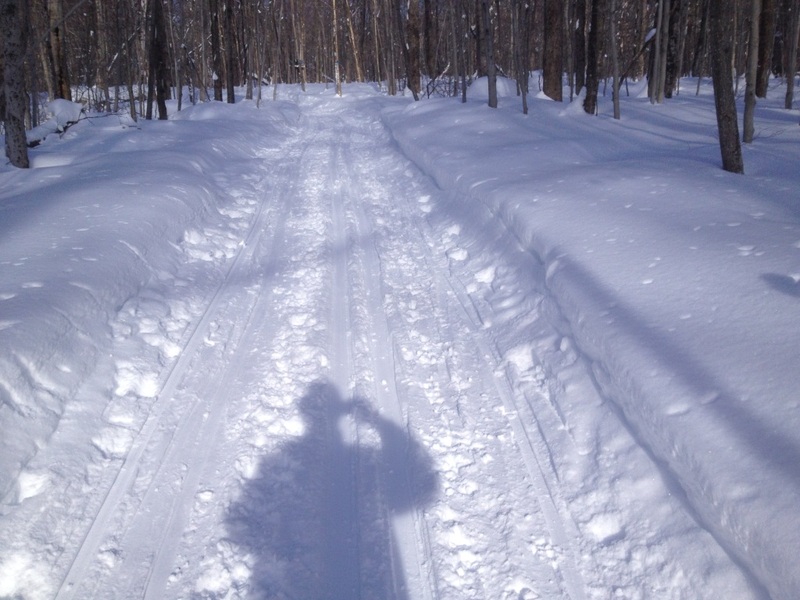 All in all, this made for a slightly longer than 8 mile loop, and brought me much farther into the forest than most skiers at Rikert usually get. There will be no more “not enough long loops” complaints from me, at least as long as the great snow holds up.